Over the Christmas holiday I wasn’t feeling well, so I had lots of opportunities to just lay around and watch movies and TV shows. At one point, I decided that I was in the mood to watch a Medieval Chinese epic — or whatever the correct term might be — something like Crouching Tiger, Hidden Dragon or The House of Flying Daggers, two of my favorite movies. We now have Netflix for Wii, which is a great way to watch movies or television just by browsing by subject. to negotiate an alliance with Sun Quan’s forces. His success gives Cao Cao the pretense he needs to attack. The allied armies gather at Red Cliff, Sun Quan’s main military base. Believing that the allied forces will be distracted by his huge navy, Cao Cao sends a cavalry force to storm Red Cliff. Zhuge Liang, however, anticipates this movie, and the allied forces defeat the “surprise” attack. Cao Cao is therefore forced to plan a naval attack against Red Cliff. His navy is commanded by two southern warriors, a fact that Cao Cao thinks will help him win the battle, since they are more familiar with the area. With Cao Cao’s forces massed across the river from Red Cliff, the allied forces have to figure out what to do — too long a blockade will defeat them just as surely as a decisive military loss. Sun Quan’s sister, Sun Shangxiang, therefore decides to dress as a boy and infiltrate Cao Cao’s army. She and Zhuge Liang pass messages back and forth by messenger pigeons. Cao Cao’s forces are unused to naval battles or the southern climate and are quickly becoming susceptible to typhoid. As large numbers of his men start to die, Cao Cao decides to place their corpses on barges and send them down river to Red Cliff, where peasants start to strip the bodies of their gear, thereby catching the disease and spreading it to the allied armies. Liu Bei decides that he cannot risk losing his entire army to disease, and he and his generals decide to break their alliance and flee the battle. Their desertion means that Sun Quan’s forces, led by his Grand Viceroy Zhou Yu, are left without enough arrows to mount a successful resistance to Cao Cao’s inevitable attack. Zhuge Liang promises to provide 100,000 arrows within three days, a feat he accomplishes by sending 20 ships covered in straw towards Cao Cao’s navy, which can’t see that their dummy ships due to a dense fog. Thinking its a real attack, they shoot the ships full of arrows, and the ships turn around and bring all of the arrows back to Red Cliff. When Cao Cao hears of Liu Bei’s desertion, he knows that it’s time to get ready for the final confrontation. Since the wind is in his favor, he decides to attack Zhou Yu’s forces with fire. Zhuge Liang, however, knows that the weather is about the change and that the wind will reverse its course in another day or two, favoring the allied forces’ use of fire. They just need to delay Cao Cao’s attack until the wind changes. Zhou’s pregnant wife, Xiao Qiao, decides to help her husband by sailing over to Cao Cao’s camp to ask him to stop the war before it’s too late. While the primary reason for Cao Cao’s military campaign is so that he can eventually overthrow the emperor and install himself on the throne, a secondary reason is that he had once fallen in love with Xiao Qiao when they were both younger. He hopes to make her his mistress once he has defeated her husband. Cao Cao refuses to call of the attack, but he is distracted from his immediate purpose by Xiao Qiao’s performance of the traditional tea ceremony. She delays him just long enough for the winds to change. Zhou Yu’s navy attacks, quickly setting Cao Cao’s fleet on fire. In the middle of the attack, Liu Bei’s cavalry reappears to cut off Cao Cao’s flank; the desertion had only been a ruse to trick Cao Cao into a false sense of security. The allied forces win the battle, but Zhou Yu’s efforts to rescue his wife almost fail when one of Cao Cao’s generals captures her and threatens to kill her for costing them the victory. At the last minute, Sun Quan, who everyone thought was a coward before, proves his mettle by helping to rescue her. Since this movie is based on a widely known historical event in Chinese history — widely known in China, I mean — I decided it was ok to summarize the entire plot. Like Homer’s epics, the point of this movie isn’t to do something new and original with the material but to evoke the common tropes and myths associated with this battle. Woo attempts to present these myths more accurately, debunking some and recalibrating others. In this mode, Red Cliff is highly successful — the more you know about its historical events, the more you can get out of it. But Red Cliff is also successful if you don’t know anything about the Han Dynasty. The battles scenes are brilliantly choreographed and filmed. The dialogue is at times slightly campy and at other times funny and witty. The cinematography is impressive, and the plot moves quickly. I loved everything about it. I loved it so much that I immediately started reading online about the film and the historical battle and learned that in Asia the movie was released in two, longer parts rather than in a shorter, one-part version released internationally (and that I had watched via Netflix). I immediately ordered the two-part version when I found that it had been released on DVD. The longer version is even better than the shorter one. Three elements stand out about it. First, Sun Shangxiang’s adventures while spying on Cao Cao’s armies is much more fully developed. She is befriended by another soldier, who happens to be rather stupid but great at sports. Their friendship adds a dimension to the film’s last battle sequence, as she tries to find him before he gets himself killed. Second, the longer version is able to develop part of the historical narrative that the shorter version omits. While the shorter version suggests that Zhou Yu and Zhuge Liang easily become bosom buddies, the longer version depicts some of the tensions in their friendship. Historically, Zhou Yu was worried that the military strategist would eventually turn against the alliance and cause problems for Sun Quan’s rule. He therefore attempted to kill him or have him killed from time to time. One example is the part about the arrows. When Zhuge Liang swears to acquire 100,000 arrows in three days, Zhou Yu vows to behead him if he fails. The longer version of the movie depicts this vow, alluding to the historical events more accurately, but also passes it off as all in good fun rather than a serious attempt to kill Zhuge Liang. And finally, the longer version gives is a more complete vision of Cao Cao as military leader and as a man. We also see his cunning, as when he sends one of Zhou Yu’s former friends to try to convince him to surrender. The trick not only fails but also gets turned around on Cao Cao, who is ultimately tricked into killing his two navy commanders. While the acting isn’t really the point in an epic war movie, the actors are all great. Tony Leung plays Zhou Yu as a firm, but likable commander who loves his wife and country above any personal ambition. 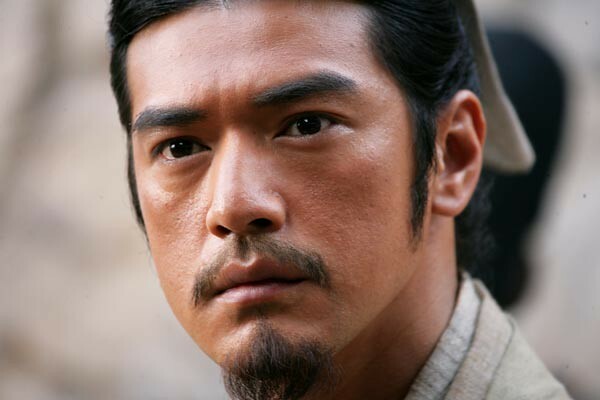 Takeshi Kaneshiro (pictured here) is great as Zhuge Liang, the strategist who also understands basic science. I, of course, don’t know anything about Takeshi Kaneshiro’s private life, but I like to think of him as my Asian boyfriend: he’s hot and seems intelligent as an actor. And I started watching the film in part because I knew he was in it. Wei Zhao is good as Sun Shangxiang, and Chiling Lin is excellent as Xiao Qiao. These last two characters remind me of something else I love about the movie: like Crouching Tiger, Hidden Dragon and The House of Flying Daggers, Red Cliff features stronger female characters, women who fight and act in the world just as the men do. I like this form of feminism in Asian movies. 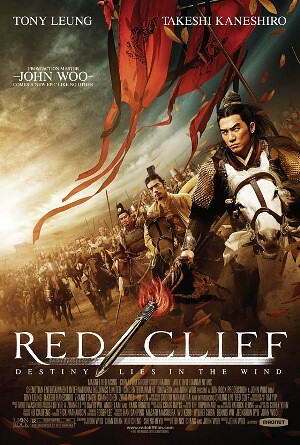 So, I highly recommend Red Cliff. It’s hugely entertaining, especially in its longer version. As far as I can tell, it takes some liberties with Chinese history, but I’m not a Chinese historian, so it doesn’t bother me. I love everything about this film.